July 21, 2018, on the feast day of the icon of the Most Holy Theotokos in the city of Kazan (1579), His Holiness Patriarch Kirill of Moscow and All Russia visited the courtyard of the Pokrovsky Stauropegial Convent of the Mother of God & mdash; a temple of the Kazan Icon of the Mother of God in the village of Markovo, Ramensky District, Moscow Region. This year marks the 20th anniversary of the beginning of the revival of the church. Primate of the Russian Orthodox Church in with. Makarov met the governor of the Moscow region A.Yu. Vorobiev, head of the Ramenskoye municipal district of the Moscow region, A.N. Kulakov, the head of the rural settlement of Kuznetsovskoye, Moscow Region, A.A. Kuzmin, rector of the Pokrovsky Stauropegial Convent of the Mother Superior Theophania (Miskin) and the monastery's dweller. In the church of the Kazan Icon of the Mother of God, His Holiness Patriarch Kirill celebrated the Divine Liturgy. His Holiness was co-served by: Archbishop Feghnost of Sergiev Posad, chairman of the Synodal Department for Monasteries and Monasticism, governor of the Trinity-Sergius Lavra; Archbishop Sergius of Solnechnogorsk, secretary of the Patriarch of Moscow and All Russia in Moscow, head of the Administrative Secretariat of the Moscow Patriarchate; Protopresbyter Vladimir Divakov, secretary of the Patriarch of Moscow and All Russia in Moscow; Archimandrite Savva (Tutunov), deputy administrator of the affairs of the Moscow Patriarchate; priest Alexander Volkov, head of the Press Service of the Patriarch of Moscow and All Russia; the clergy of the Moscow diocese. The divine service was attended by: Governor of the Moscow region A.Yu. Vorobyov, Deputy of the State Duma of the Federal Assembly of the Russian Federation V.I. Resin, Chairman of the Committee on International Affairs of the State Duma of the Federal Assembly of the Russian Federation L. Slutsky, Director of the Information and Press Department of the Ministry of Foreign Affairs of the Russian Federation M.V. Zakharova, head of the Ramenskoye municipal district A.N. Kulakov, the head of the rural settlement Kuznetsovskoye AA Kuzmin. Among the prayers for the Liturgy were the abbess of the Intercession Monastery of the Abbess Theophania (Miskina), the sisters of the monastery, pupils of the monastic shelter for girls, benefactors. Divine service chants were performed by the choir of the Pokrovsky Stavropigial Convent in the Trinity-Lykovo and the Choir of the Podvorie Pokrovsky Monastery in the village of Markovo under the direction of E.A. Lobovikova. On the channel "Union" was a live broadcast of the Patriarchal Divine Services. For the convenience of believers, the divine service was broadcast on screens installed on the territory of the Kazan temple. After a special litany, His Holiness the Lord raised a prayer for peace in Ukraine. During the service, the Primate of the Russian Church ordained deacon Dimitri Kelmanov, clergyman of the Church of the Assumption of the Blessed Virgin Mary in Veshnyaki, Moscow, to the rank of presbyter. Preacher before the communion spoke priest Sergius Sivokon, clergyman of the Assumption of the Blessed Virgin Mary Church in Trinity-Lykov, Moscow & mdash; Podvorie Pokrovsky Stauropegial Monastery. At the end of the Divine Liturgy, His Holiness Patriarch Kirill took the lead in the procession around the church. 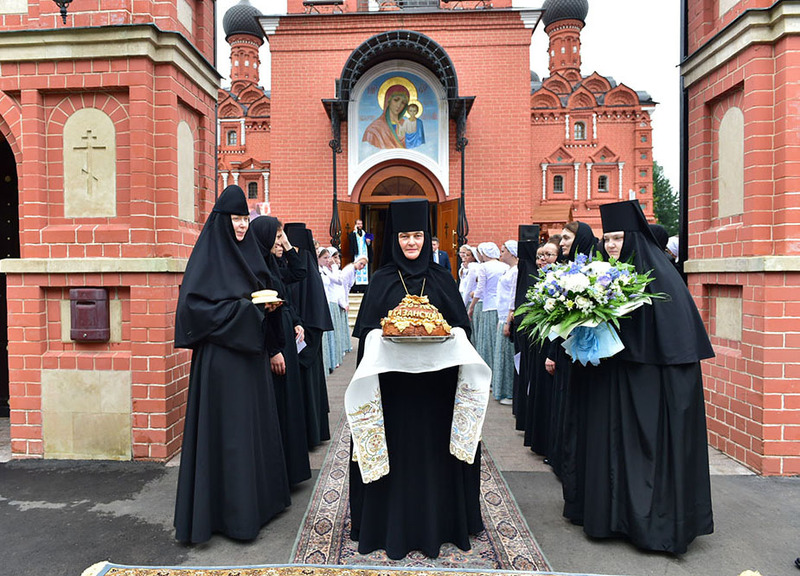 In the square in front of the temple, the abbess Feofaniya greeted His Holiness and presented His Holiness with the old list of the Kazan Icon of the Mother of God. The Primate of the Russian Church addressed the participants of the divine service with the First-Hierarchal Word. As a gift to the farmstead in with. Markovo His Holiness passed the image of the holy Royal Passion-bearers. Then His Holiness Patriarch Kirill presented church awards. In consideration of works for the benefit of the Holy Church, the abbess Feofaniya (Miskina), rector of the Pokrovsky Stauropegial Convent at the Pokrovskaya Outpost in Moscow, was awarded the Patriarchal Charter. & laquo; I would like to say a few words about Cherian Ipene. He is in the baptism of Zechariah, we so call him: brother Zachary. For most of his life he successfully engaged in business & mdash; and in India, where he was born, both in the United States and in Russia. But as an Orthodox person, a believer, he gave most of all his income to the poor, and above all, & mdash; on orphans. He had very large programs of assistance to those in need in California, in the southern state of India Kerala and here in Moscow. Very often Brother Zachary met Easter and Christmas not at home, in a comfortable Moscow apartment, but at Paveletsky railway station among homeless children. And until now, most of his funds, he sends to help, first of all, street children. Considering the help of the Pokrovsky Stavropigial Convent of the Mother of God in Moscow in the village of. Markovo Ramensky district of the Moscow region Patriarchal letters were also presented to: the head of the Ramenskoye municipal district of the Moscow region, A.N. Kulakov; Deputy Chairman of the Moscow Regional Duma I.V. Chistyukhin; the Prosecutor of the Astrakhan Region, A.G. Lychagin; Deputy Head of Administration of the Ramensky District V.K. Dolgushin; Deputy Head of the Secretariat of the First Deputy Chairman of the Federation Council of the Federal Assembly of the Russian Federation N.V. Fedorova OP Savelov; General Director of OJSC "Ramensky Electrotechnical Plant" Energy "& raquo; A.G. Hakobyan. In conclusion, the Primate of the Russian Church congratulated Mother Feofania, the awardees and all those who gathered with the feast of the Kazan Icon of the Mother of God. All the participants of the divine service were awarded icons of the Mother of God & Kazan 'raka' with the Patriarch's blessing. At the end of the Liturgy, a festive meal was held, after which His Holiness Patriarch Kirill visited the subsidiary farm of the farmstead. His Holiness familiarized himself with the work of the shop producing dairy products, inspected the cowshed, stable, apiary, ponds, a nursery for dogs and a bird's yard. The Kazan church in the village of Markovo near Moscow was built in 1672-1680. During the time of the God-fighting the temple was closed and ruined, a vegetable storehouse was located within its walls. In 1962, the temple of the village of Markovo was given the status of an architectural monument of federal significance, but the ruin of the shrine continued. In the 1970s. from dilapidated, but still whole iconostases & la lovers of antiquity & raquo; were barbarously torn out all the image. Only the iconostasis of the XVII century, miraculously preserved in one of the side-chapels, was transferred to the Center for Old Russian Culture and Art named after Andrei Rublev. The building of the temple continued to collapse. In 1998, the abbess of the Pokrovsky Stavropegic Women's Monastery in Moscow Abbess Feofaniya (Miskina), looking for a place in the nearest suburbs for the monastery's courtyard, drew attention to the abandoned temple in ruins on the picturesque bank of the Moskva River. She appealed to His Holiness Patriarch of Moscow and All Russia Alexy II for the blessing to build an auxiliary farm here. In June 1999, the Kazan temple of the village of Markovo was transferred to the Pokrovsky Stauropegic Convent for the opening of the monastic monastery and the establishment of the monastery. On November 13, 2004, His Holiness Patriarch Alexy II consecrated the three chapels of the Kazan Icon of the Mother of God in the courtyard of the Intercession Monastery. Now on the monastery's metochion there are about 15 residents of the Pokrovsky monastery, there is a vast subsidiary farming & mdash; field, garden, garden, cowshed, chicken coop, apiary, ponds with fish. Every day a common sister rule is made at the courtyard: in the morning & mdash; the midnight woman, the Akathists to the Savior, the Kazan Icon of the Mother of God and the blessed Matrona; in the evening & mdash; evening prayers, the chapter from the Apostle and the Gospel, as well as the procession with the reading of the prayer of "Virgin of Devo, rejoice & hellip; & raquo; around the whole territory of the farmstead. The Church of the Kazan Icon of the Mother of God is regularly visited by whole families by residents of Bronnitsy, Zhukovsky, Ramensky and other nearby cities and other settlements.